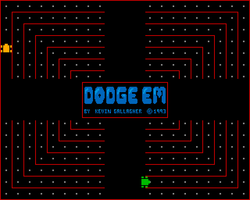 privilege of interviewing Kevin Gallagher who has created some fantastic arcade remakes on the Amiga including Dodge Em - Galaxians - Gorf - Scramble and Space Invasion. How many people were involved in Towerbyte Software? Were all your games public domain or shareware or did you have some licenceware or commercial games published? All the games that I made were either PD or Shareware. We did have plans to do commercial titles but we all went our seperate ways before we could get anything off the ground. Which public domain libraries , computer magazines did you find the most supportive to programmers in the 1980s / 90s? What characteristics do you believe a game needs to be enjoyable? Its got to be playable. Its no good creating a fantastic looking game only to find out that it is not responsive. Another thing is the learning curve. Games that are too difficult at the start loose their appeal and people give up playing them. A good example of this is the Shadow of the beast games. Technically they are amazing but the playability suffered alot although this was addressed in the third beast game to some extent. I would say that one of the most enjoyable games ever on the Amiga was Superfrog by Team 17. The shoot em up for sure although I do enjoy modern-day first person shooters. My favourite of which is still Return To Castle Wolfenstein. Do you think the commercial games of today are lacking in quality, compared to the old arcade games? Why did making arcade conversions appeal to you? 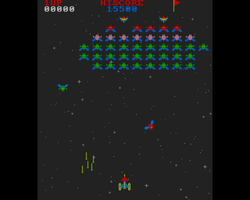 When I was a kid (long time ago now) I used to hang around the arcades at weekends feeding 10p's into the Space Invaders machines. I used to be amazed at these new video games and what they could do. Then one day a game came out that got everybody hooked. There were queue's of people stacking 10p's on top of this machine and waiting for hours just to play it. This game was called Defender. In the late 80's I eventually got into programming but it wasn't until the Amiga came out that I decided to have a go at a coin op conversion myself. I thought that the Amiga was a great machine and I wanted to see some of these great video games converted for it because hardly anyone else was doing them. What programming language did you use to create your games? When I first started programming on the Amiga I got into 'C' but I wasn't proficient at it enough to be able to create games with it. AMOS then came out and this changed everything :-) There was no need to read through the entire contents of the Rom Kernel Reference Manuals or the Hardware Reference Manual because AMOS made things so much easier. All my arcade games on the Amiga were created using AMOS. How long did the games take to make from start to finish? Each one took about a month to make give or take a few days. This was done during evenings and weekends. Which of the games did you enjoy programming the most? 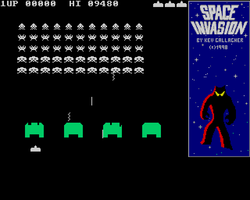 Probably Galaxians as this was one of my favourite games ever. It was one of the easiest to make as well and I actually managed to include some of the original sounds effects in the game too. Which game caused you the most difficulties? 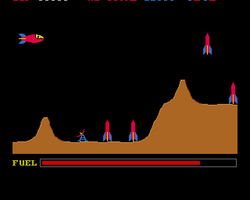 Gorf was very difficult to manage because it was like 5 games in one. When developing this game I created each section of the game as a completely separate game as this made it easier to iron out any bugs etc. I then merged each section into its own procedure within the final game. When I created this game there was no such things as emulators or MAME to work from. So Chris and I actually went down to the arcades with a camcorder and actually filmed people playing it. I then studied the video footage to create the graphics for the game. I really wanted to get the speech in there as well by utilising the Amiga's narrator.device but it was just too memory intensive to include it. 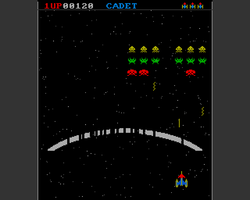 ADF Disk Image containing Dodge Em, Galaxians, Gorf, Scramble and Space Invasion. Galaxians was reviewed in Amiga Power issue 15. It also appeared as a cover disk in The One issue 45 and Amiga Format issue 127. Visit Amiga Magazine Rack. Gorf was reviewed in Amiga Force (issue 16), The One (Issue 65 and issue 71). The game also appeared as a cover disk in Amiga Power issue 34 and Amiga Action issue 67. Visit Amiga Magazine rack. 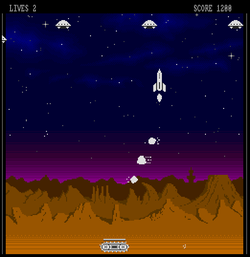 Space Invasion was included as a magazine cover disk in Amiga Power issue 32 and Amiga Dream issue 3. Galaxy Wars can be downloaded from the Amiga Magazine Rack - Amiga Action - Issue 69 cover disk two. The following are games which were not completed due to Kevin moving onto other projects. Were there any unfinished projects you wish you had finished? Yes. I wished I had finished Harry The Haddock properly. It was released with lots of bugs in it but I was under pressure to release it in time for the Christmas period. Did you work independently or in a team ? I worked on my own on my stuff and Chris did the same. If we needed any special graphics or sounds in the games then we just asked Graham and Andre to knock something up. Which amiga system did you prefer Amiga 500 or Amiga 1200? At the time, the A1200 was the machine I preferred simply because it was easier and quicker to develop stuff on. Today, I use an Amiga 600 with all the extra's on it as I need a machine with the development capabilities of the A1200 but with a similar speed to an A500. This helps me to optimize my code if things slow down. Do you enjoy playing your own games or is the creation the most satisfying part? Did you convert your games to other systems such as the Atari ST? Are you still involved with programming today? Absolutely! On the Amiga too! Although in recent years I have been involved with PC development, I still go back to the Amiga because I like to try out new ideas that I have had. Have you got any future plans for new games on the Amiga? What was the best thing about programming on the Amiga? Trying out new ideas for making things go faster. It is quite simple to get a blitter object (bob) on a display. But trying to get 50 of them all moving around at 50 frames per second on an A500 is another matter. God knows how many man hours I have spent time-testing new algorithms out but it is so satisfying when you can say ,"great! I can now do that function much quicker", which leaves you more time to do other stuff. Its all about time. 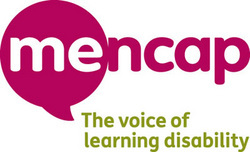 AmigaPd would like to thank Kevin for kindly giving us his time to answer these questions. Fingers crossed some of these future projects will materialise into new games being released. Another big thank you to Kevin for allowing us to include his 5 disk compilation containing up dated versions of Dodge Em, Galaxians, Gorf, Squamble and Space Invasion.